The title of this post is a tong-twister for sure. If you love pets or if you want to support two great Pittsburghers please take a moment to check out these two important crowdfunding campaigns. 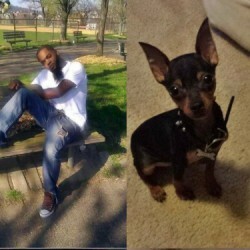 Andre Gray & his dog, boss, were killed by gun violence last year, his family is raising $3500 to install a memorial bench at the Bernard Run dog park in Lawrenceville. Andre would be turning 35 on Saturday, August 8. Several IheartPGH readers have reached out to me and asked me to share this story, they are eager to help the Gray family reach the fundraising goal before Andre’s birthday. Sue Kerr wrote a lovely post about Andre for her blog Pittsburgh Lesbian Correspondents – Andre Gray Would Be 35 This Saturday #StoryOfHisLife. Donate Here: http://bit.ly/1IwvcKR As of Friday afternoon they are just short of $1000 of reaching their goal. This is one of those campaigns that I feel compelled to support because I want Pittsburgh to be filled with small businesses like Smiley’s. 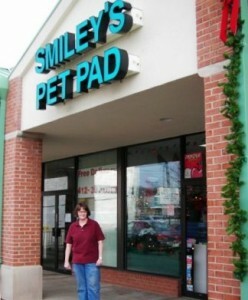 Smiley’s Pet Pad used to be on Walnut Street in Shadyside, they are now located on Highland in the shopping plaza across from MadMex. Ginny Smiley started working at the Pet Pad in 1972 and eventually bought the business from the originally owner. Smiley’s Pet Pad could use some community support – construction on the Highland Avenue Bridge and competition from a national chain which moved into the space where Border Books used to be has been tough on this little shop. Please take a moment to watch the video, make a contribution or stop by and shop at Smiley’s Pet Pad. Amy Enrico who owns the Highland Park Coffee Shop Tazza D’Oro wrote a blog post about Smiley’s here. If you support Smiley’s GoFundMe campaign, Amy will buy you a cappuccino. Take a moment to like Smiley’s Pet Pad on Facebook here.